I work for a firm of consulting engineers in the oil & gas and mining industries (my day job, which I won’t be giving up any time soon), and the thought occurred to me that I probably had an unusual start to my career in the 1980s. 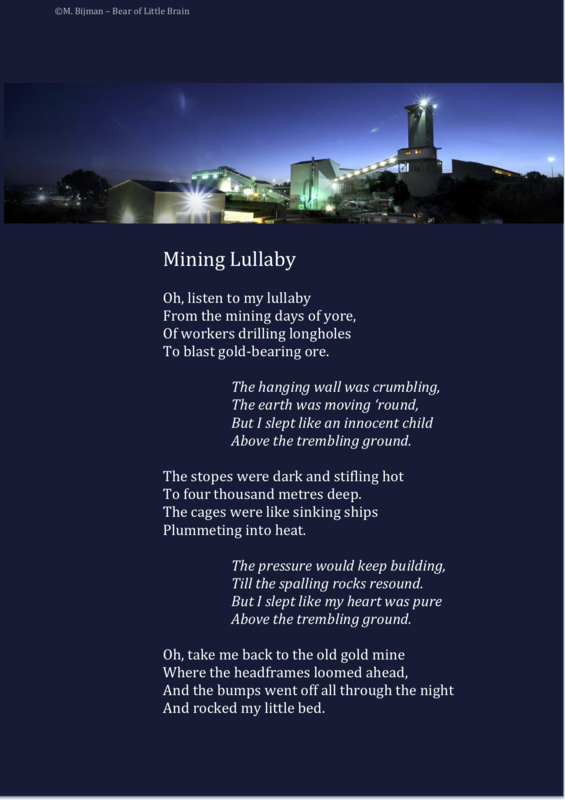 “Mining Lullaby” is about that. I wrote it with “The Cremation of Sam McGee”, by Robert W. Service, in mind – the same straight-forward, traditional A-B-C-B rhyme scheme in quatrains. 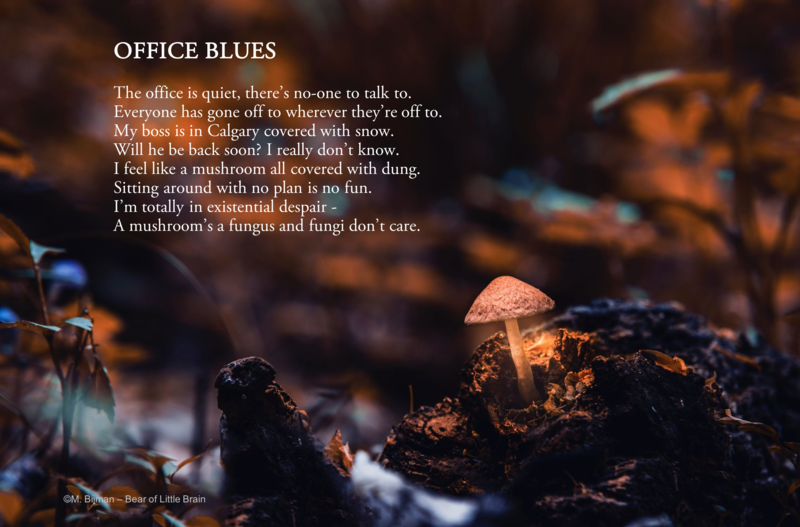 “Office Blues” is a poem in couplets that I wrote when I was having a bad day at work and feeling conflicted. You know, one of those days when you can’t seem to get organized. So I was trying to write an email and not even that came out properly – this resulted in stead. Why do I write poems? Because writing poems is about constantly striving to produce the perfect form and image. It’s probably not achievable, but the practice is very good for my language skills. Both poems are among the other poems on my page, Loose rhymes by a Bear of Little Brain. The more serious and formal poems are on my page, Poems about paintings from a Bear of Little Brain. Diary of a Somebody by Brian Bilston, due out 13 June 2019 by Picador, UK. Whereas I get the urge once every couple of weeks – usually in a moment of distraction – to write a poem, the Internet’s most prolific poet, Brian Bilston, is publishing his first novel in June and it will contain 150 poems! 150!! 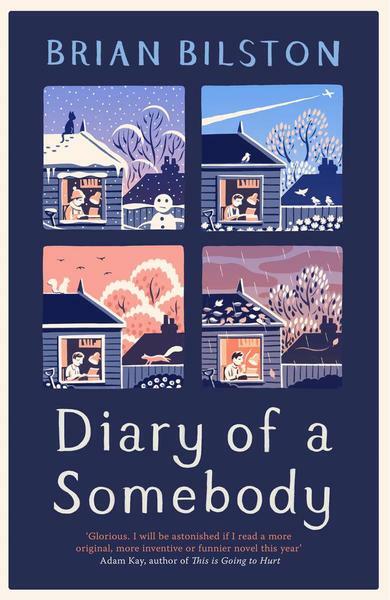 Called Diary of a Somebody, he says “It’s a novel written in the form of a diary, featuring about 150 poems along the way, and doesn’t mention Brexit once.” I’m looking forward to it. Het dit net een keer in my lewe reggekry om ‘n gedig te skryf en bewonder diegene wat dit wel kan doen! Jou Mining Lullaby is absoluut pragtig vir iemand wat op die Witwatersrand grootgeword het.